Safety solvent – Totally non-flammable, 48 000 volt dielectric strength. Non-conductive – Non-combustible – Non-corrosive – Ozone safe – Safe on energized electrical equipment. Dissolves grease and rinses away dirt and grime without injury to working parts. Contains an accepted replacement for 1,1,1-trichloroethane. Contains no cfc’s or petroleum distillates. High dielectric strength combined with non-flammability make this the only degreaser safe for use on motors, generators, relays, and control panels even while equipment is in operation. USE : For industrial, institutional, food plants. Hand cleaner with fine granules of pumice stone (lotion) USE : Removes most : grease, ink, paint, glue, tar, grime. Cleans stains on clothes, car upholstery, white wall tires, etc. Contains more emollients and moisturiser (lanolin, glycerin) to soften skin and prevent chapping. Accepted by Agriculture Canada – Food Production and Inspection Branch, requested for use in food plant. Cutting and tapping fluid COOLANT – LUBRICANT USE : A synthetic lubricant effective in lubricating and cooling such operations as punching, sawing, machining, cutting, tapping, boring and grinding on all steels and non-ferrous metals. Prolongs tool life. Increases production rates. Results in cooler workpiece with less tool burning. Fluid is transparent providing better visibility of work area. Can be removed with cold water or solvent.For industrial, institutional and food plant use. Food grade lubricant A lubrication made of USP liquid petrolatum and propellant to provide a sanitary means of lubricating dairy and food processing equipment. Authorized N by CFIA (Canadian Food Inspection Agency). USE : A Sanitary Lubricant Used On : Slides, bearings, pistons and rings. Seals and pump part, pans, containers, belts, etc. Used In : Fast service preparation, cut meat cold room packaging in supermarkets, pre-packaged meat units for franchise outlets, ice cream filling equipment, milk bottle filling equipment. Universal solvent Ozone safe, dries instantly and residue free. USE : A powerful degreaser that rapidly removes : grease, oil, dirt, and many other residues oN food plant machinery and equipment, chain, cable, etc. For industrial, institutional and food plant use. Belt dressing for belts : V, flat, round, in leather, rubber, fabric. Increases power without gumming. Will not glaze or collect dirt. USE : Works well in wet, outdoor conditions. For industry : Automotive, farm, industrial, institutional, food plant, belts dressing. Cold zinc gavanizing Rust proofs metal. Prevents rust creepage. Equivalent to hot dip zinc galvanizing. Highly resistant to salt corrosion and water. Electro-mechanical causes healing action where surface is crashed or broken. USE : For industrial, institutional and food plant use. Stainless steel coating High temperature up to 260ºC (500ºF). Chemical, corrosion, abrasion resistant. A super tough coating made from pure stainless steel flakes combined with a polyurethane resin. Non-flammable when dry. USE : Protects metals and ceramics from chemical processing and production equipments, fire hydrants, steam pipes, radiators, exhausts, mufflers, boilers, engines, ovens, tanks, heat exchangers. For industrial, institutional and food plant use. 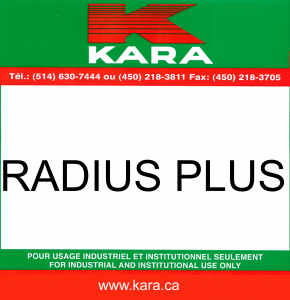 Gear oil food grade KARA FG gear oils are first grade lead-free industrial oils. The additives provide an excellent extreme pressure, oxidation and anti-foam protections to meet the highest standards in the food industry. Avoid contamination of food in the use and storage of this product. Only use sufficient product per application to achieve desired results. (n1) from the CFIA (Canadian Food Inspection Agency). 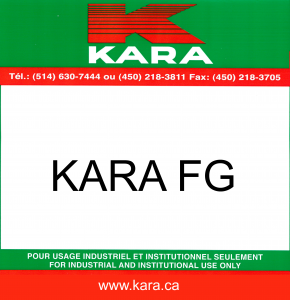 KARA FG gear oils produce excellent results in all enclosed gears (worm, helical, bevel and spur) operating under normal or heavy shock-loading conditions. For use in food processing plant and/or industrial application. Availability : Grade EP 68, 100, 150, 220, 320, 460, 680. 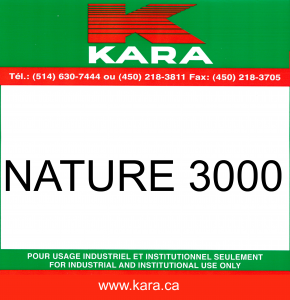 Synthetic gear oil food grade KARA FG synthetic gear high performance oils containing selected additives to offer anti-wear, extreme pressure and oxidation. Oil has non odour and no taste and offer a high viscosity index. Do not add directly to the food. Only use the amount necessary to achieve the technical effect. Remove any excess lubricants from food contact surfaces. To be used in keeping with food manufacturing practices (GMPs). 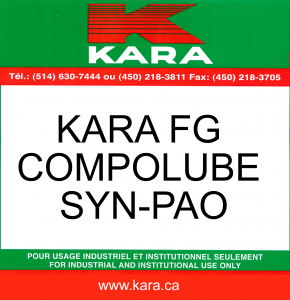 KARA FG synthetic gear oils produce excellent results in all enclosed gears. The “n” approval from the CFIA (Canadian Food Inspection Agency), allow the use of KARA FG synthetic oil where there is a potential for incidental food contact. For use in food processing plant and/or industrial application. Availability : EP 220, EP 460. Food grade hydraulic oil A blend of high viscosity and high quality oils. Additives are added to provide excellent anti-wear, anti-oxidation, anti-rust and anti-foam protection to meet the highest standards in the food industry. The oil should not be added to the food. Avoid food contamination during application and storage (n2) from the CFIA (Canadian Food Inspection Agency). 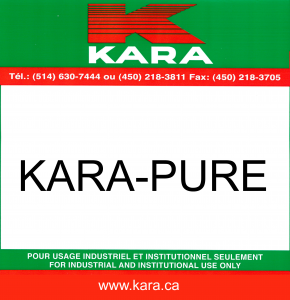 KARA FG hydraulic fluids are recommended for use in all hydraulic systems and can also be used in circulating systems and could be used for bearings and gears under normal loads where extreme pressure additives are not required. For use in food processing plant and/or industrial application. Availability : Grade ISO 22, 32, 46, 68, 100, 150. Stainless steel and metal cleaner Restores original luster – Cleans – Shines and protects – No 1,1,1-Trichloroethane – No chlorinated solvents – No cfc USE : Removes finger-marks, grease, soil and watermarks from stainless steel, aluminium, desks, Formica, arboreta and fine furniture. Leaves a lustrous protective coating that beatifies and repels moisture. For industrial, institutional and food plant use. Degreaser 100% natural Contains No : Chlorinated solvents, petroleum distillates, acid and caustic. Environmentally safe. No toxic fumes, Non-corrosive. 27 000 volt dielectric. Heavy flushing action quickly dissolves and removes grease, grime, asphalt, oil and tar. High-pressure spray penetrates, loosens and lifts soil away. Easy to rinse. USE : Auto motors, garbage cans and trucks, concrete and machinery. For industrial, institutional and food plant use. 5 fonctions spray 1- Lubricating, 2- penetrating, 3- Cleaning, 4- Protecting, 5- Displacing moisture. Non-chlorinated. Dielectric 38 000 volt. Non-flammable spray. Meets MIL Spec C-23411. Displace water. Easy to apply. Ready to use. Retards corrosion and prevents rusting. Never dries. Loosens nuts and bolts, rust and scale. Leaves water-displacing sheild and lubricating film. Prevents mechanical and electrical failures due to moisture. Preserves and prolongs life of valuable equipment. USE : Metal surfaces and parts of electrical, mechanical, machinery, engines, electric motors, circuits and ignition systems, in factories, workshops, garages, farm, aviation. For industrial institutional & food plant use. Hand cleaner citrus-based used with or without water USE : Removes most : grease, ink, paint, glue, tar, grime. Cleans stains on clothes, car upholstery, etc. Contains more emollients and moisturiser (lanolin, glycerin and aloe vera) to soften skin and prevent chapping. Accepted by Agriculture Canada – Food Production and Inspection Branch, requested for use in food plant. Hand cleaner citrus-based with granules of pumice stone, used with or without water USE : Removes most : grease, ink, paint, glue, tar, grime. Cleans stains on clothes, car upholstery, etc. Contains more emollients and moisturiser (lanolin, glycerin and aloe vera) to soften skin and prevent chapping. Accepted by Agriculture Canada – Food Production and Inspection Branch, requested for use in food plant. Hands soap, pearly Use for : hands, body and hair under the shower. 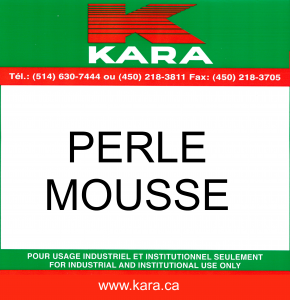 PERLE MOUSSE is a rich creamy lotion with Lanolin, Glycerine, Aloe Vera and pure coconut oil base. Leaves the skin soft and clean with a nice perfume. Safety solvent, totally non-flammable Totally non-flammable – Ozone safe. Safe on energized electrical equipment with a 40 000 volt dielectric strength. Fast evaporation. Non-conductive, non-combustible, non-corrosive. USE : Dissolves grease and rinse away dirt and grime without injury to working parts. High dielectric strength combined with non-flammability make this the only degreaser safe for use on motors, generators, relays, and control panels even while equipment is in operation.For industrial, institutional, food plants use. Penetrating lubricant with Moly and PTFE. Loosens nuts & bolts – Prevents rust – Never dries – Contains additives to protect parts against harmful effects of moisture and corrosion. USE : Wherever a mechanical assist is needed, Loosens frozen nuts and bolts. Lubricates moving parts. Prevents corona arcing. Loosens scale and dirt. For industrial, institutional and food plant use. Accepted (n1) by the CFIA (Canadian Food Inspection Agency). Fast acting solvent degreaser with flush action Cuts through and removes : grease, oil, tar, asphalt, adhesives, wax, ink, fresh paint and more. Quick drying. A heavy duty and powerful spray fast acting, flush action aerosol. Fortified with citrus terpene to enhance cleaning and reduce solvent odour. Will not harm most painted surfaces. USE : On industrial equipment, automotive parts, printing presses, generators, tools, HVAC equipment, construction and road (asphalt) building machinery, packaging equipment and more. For industrial, institutional and food plant use. Paste hand cleaner with granules of pumice stone USE : Removes most : grease, ink, paint, glue, tar, grime. Cleans also stains on clothes, car upholstery, white wall tires. Contains more emollients (Lanolin, Glycerine, Aloe Vera) to soften skin and prevent chapping. Accepted by Agriculture Canada – Food Production and Inspection Branch, requested for use in food plants. Coil cleaner Bio-Enzymatic action, Powerful foam action, Non-acid, No harsh fumes, Non-flammable. A powerful, thick, directional spray, clinging foam, which removes dirt, lint and grease from coil and other hard surfaces. Water-based foam creates no harsh vapours and leaves a fresh scent. USE : Radiators, roof heating and cooling units, wall and window units, ventilators, dryers, ice machines, refrigerators, watering. For industrial, institutional and food plant use. Avoid contamination of food in the use and storage of this product. For use on non-food contact surfaces only. Chain and cable lubricant, fortified with Moly. Lubricates & protects. Forms protective shield. Lubricates up to 180ºC (350ºF). The protective Moly shield gives a minimum lubrication at higher temperature. USE : For industrial, institutional and food plant use. Dry lubricant with PTFE, chemically inert, non-oily, fast drying. Lubricant and release agent made with an extremely fine fluorotelomer powder. Features outstanding microscopic film forming properties and resists temperatures from -73ºC to +260ºC (-100ºF to +500ºF). USE : For industrial, institutional, food plants. An odorless, stainless coating that is more slippery than silicone, graphite or oil. The dry film is not affected by most chemicals. Food grade synthetic oil VERSA LUBE is a synthetic hydrocarbone food grade fluid formulated with first quality 100% pure Polyalphaolefin (PAO) synthetic base oils. Formulated to offer a superior lubrication under severe conditions subject to extremely high or low temperatures. It offers thermal stability and superior protection against oxidation, anti-wear and corrosion. 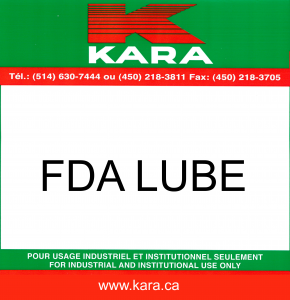 VERSA LUBE may be recommended for : bearings, gearboxes, pumps and chains.Accepted (n) from the CFIA (Canadian Food Inspection Agency). Do not add directly to the food. Excellent lubricants to be used in HACCP (hazard analysis and critical control point) plants. For use in Food plant and other industrial use only. Availability : Grade ISO 100, 150, 220, 320, 460, 680, 1000.